Kamilah Aisha Moon has received fellowships to the Prague Summer Writing Institute, the Fine Arts Work Center in Provincetown, MA, Cave Canem, and the Vermont Studio Center. Her work has been featured in several journals and anthologies, including Harvard Review, jubilat, Sou’wester, The Awl, Oxford American, Lumina, Callaloo, Superstition Review, Villanelles, and Gathering Ground. Her poems and prose have been nominated for the Pushcart Prize. A teacher of English and creative writing at various institutions, Moon is the author of She Has a Name (Four Way Books) and holds an MFA in Creative Writing from Sarah Lawrence College. 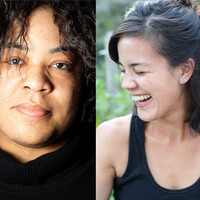 Michelle Chan Brown’s Double Agent was the winner of the 2012 Kore First Book Award, judged by Bhanu Kapil. Her work has appeared or is forthcoming in Blackbird, The Missouri Review, Witness, and many others. A Kundiman fellow, Michelle received her MFA from the University of Michigan, where she was a Rackham Fellow. She was a Tennessee Williams scholar at the Sewanee Writers’ Conference and has received scholarships from the Vermont Studio Center and the Wesleyan Writers’ Conference. Her chapbook, The Clever Decoys, is available from LATR Editions. She lives with her husband, the musician Paul Erik Lipp, in Washington, D.C., where she teaches, writes, and edits Drunken Boat. Read poems by Kamilah Aisha Moon here, here, and here. Read poems by Michelle Chan Brown here, here, and here.